Lance Corporal Jose S. Marin Dominguez, Jr. was born in Juarez, Mexico, on 19 April 1984. He graduated from Liberal High School in Liberal, Kansas, in 2003, enlisted in the Delayed Entry Program, and reported to Marine Corps Recruit Depot, San Diego, California, in October of that same year. After graduating from recruit training in January of 2004, he reported to the School of Infantry (SOI) for Marine Corps Combat Training (MCT). Completing MCT, Lance Corporal Marin Dominguez reported to Fort Leonard Wood, Missouri, for the Motor Vehicle Operator Course and obtained the Military Occupational Specialty 3531. In April 2004, he was transferred to 3d Battalion, 3d Marines, and assigned to Motor Transportation Platoon, Headquarters and Service Company. While assigned to America’s Battalion, he deployed to Afghanistan in support of Operation ENDURING FREEDOM in 2004 and deployed to Iraq in support of Operation IRAQI FREEDOM in 2006. In Iraq, he was assigned to “Freelance,” a unit that provided security for Explosive Ordnance Disposal Team 2, Detachment 4. 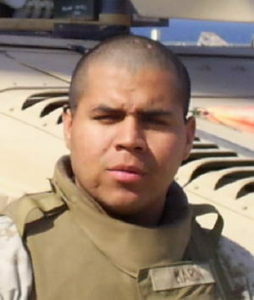 Lance Corporal Dominguez was killed in action on 14 May 2006. His personal awards include the Purple Heart and the Combat Action Ribbon. He is survived by his mother, Olivia Marin, and his father, Jose Marin Sr.